A day by day story of my UK Tour 2018.The tour turned out to be a journey in the sign of wood! Ian Aaron King, that's his full name, told me that he inherited the land years ago from his father. The barren land was empty. No house or trees. One of the first things he did was making a start with planting trees with the history in his mind. Ian told me that since the time of Robin Hood landowners, kings and rulers cut down a lot of forest not only because they needed the wood. It was, like it happened in Scotland also, policy to wipe forests out to take away the living from the free people. No forests meant no wood for houses and fire, no game to hunt. And centuries later there was the industrial revolution that gave the grace blow to the forests in England. With all that in his mind he started with planting trees to restore the land and environment and to bring back what had been lost. “Well the people here in the region were scornfull about my planting trees but I knew this was the best to do. Perhaps not for me but for the next generations.” Ian said. Wow, that was impressive to hear. Not someone who only complaints and points the finger to the others or to the government but who tries to make the difference. He plants trees, larch and oak, to benefit another generation. I left Cragg Vale and drove to Staindrop. I found a campsite not far away from Staindrop and went to the village hall for the monthly open mic night. I arrived in time and that was usefull. I met the manager of the village hall and his help was very usefull. He suggested that I could start the evening. So I did. The other musicians and bands where very nice and the conversations about guitars and songs were very interesting. The people were very kind and treated me on beer and toasts and I felt very welcome. The good thing about Folk Clubs is, in my opinion, that everybody is equal and respected for what he or she is playing or singing. No competition or envious feelings. Well that is how I experienced the Folk Clubs. I don't like to make reservations on campings and I also don't inform myself about the holiday season and that gives sometimes very nice outcomes. I was thinking of going to a camping in Whitby. But the owner of the camping close to Staindrop had browsed his eyesbrows when I told him that I would go to Whitby in the hope to find a place for my tent. “It is a bank holiday weekend and I think Whitby will be very crowdy.” He said. And he was right. On my way to Whitby I called the camping and they were full booked. So I tried plan B. During a cappuccino I found on Google a camping on which I had been a year before called Serenity Camping in Hinderwell. And they had a place for me. So I arrived in the early afternoon and installed my tent and stuff. Then I discovered that Mickleby was just 3 miles walking from the camping! So after shoppings and cooking I took my Martin D15 and walked to Mickleby. Walking is often good for the body and inspiration. Running is for athletes. And according to my new song “Step By Step” Masters NEVER run. Anyway, walking along roads and meadows I came close to Mickleby and suddenly a little lamb jumped over the fence and came to cuddle me. That was such a nice experience. But the little lamb didn't want to go back to his mother in the meadow and whatever I tried it jumped again and again over the fence to be with me. But finally I think I convinced the little animal to stay safe with his mother and I continued my way to Mickleby. I arrived at the White Hart pub. Inside I met Tony and recognised him from last year. He explained me that a 'Hart' is another word for deer. Funny because In Dutch we say 'Hert' . And that a lot of little villages names in Yorkshire are form the time that the Vikings were in Yorkshire. The word 'By' in for example 'Mickleby' is Danish for village or group of houses. The White Hart Folk Club is a very informal and cosy gathering of Folk Music lovers. Because of the bank-holidays there were not so much people and it gave me the possibility to perform some more songs. One of the songs was 'Light' and one of the older members asked me to do the song again. In those moments I feel one with the music and listeners and I realise that this is life in optima forma. Life as it has to be. Some days are different. Like this day. After breakfast and coffee my neighbour came to me to thank me for the nice music that I played the day before. Well I had not played that much because I was actually tuning my guitars and ukulele but I thanked her for her compliments and we talked a short while. Later I went to the beach and spend some time at the shoreline. Back on the camping I passed a caravan where a man sat who made all kind of objects from wood. I started to talk to him and soon we had a very interesting conversation about what he was doing. I was attracted to his hand made spoons with texts. But also a sort of deep and round dish made out of oak. But most of all his love for wood touched me the most. Wood! Again wood. Days before I was on the camping of Ian Aaron King who plants trees. And now I met Shaun the woodcrafter and spoon maker. So I realised this tour is all about wood?! Oh I like gestures like that . Thank you again Shaun. Today I decided to relax and work on the new Ian Aaron King song. I doubted about going to a Folk Club in New Castle upon Tyne that night while it was a 1.5 hour drive. I discovered that during the making of my tour schedule I wasn't aware of the big distances. So a lesson for next year to plan smarter. Anyway, I stayed at the camping and made a walk along the cliffs with hat and guitar and enjoyed the views. At dawn, around 9:30 pm, Venus appeared in the sky as a clear and shinny light! Ha ha ha !! Yes of course, a Troubadour also has to do the laundry now and then. This time my Longhorn Green Lumberjack Shirt! I bought it a year ago and never dared to wash it because I was afraid it would shrink too much. So I took a bucket with hand warm water with some Biotex and let the shirt soak for two hours and then I hanged the shirt on the clothesline. The weather was perfect and the next day my shirt was as new. With a little pain in my heart I left this nice camping and I drove today to Cramlington. A little town 15 miles North of NewCastle upon Tyne. I could pack in my tent dry and when I arrived in Cramlington it started to rain. Last year I met Mike Donnelly of the Bridge Folk Club and he promised to come and listen to me when I played close to him. So during the night in the Cramlington Folk Club Mike appeared and it was nice to meet him again. The Cramlington Folk Club is by the way a very nice and professional organised Folk Club and I think I will go back for sure next time to visit this Club. Mike invited me to sleep at his house. With a nice glass of wine and some cheese we had a good chat together. Like last year I could use their great guest room with a nice view over Newcastle. After breakfast I drove to Whitby. I arrived around noon and found a nice spot on the camping with a view on the Abbey. Did some shoppings and enjoyed the afternoon. My plan was to visit the Whitby Folk Club. Last year I visited the graveyard and the higher grounds where the ruins of the Abbey are. And as you might know I wrote the song Whitby Abbey Graveyard Blues, about a couple that is buried on the church yard. So I came back to this place to feel and look at what I saw last year. And it is not a surprise; it is always different. But it was still great to be here. I found the headstone of John and Anna, the stained glass windows of the church and the 199 steps of the stairs. This year I took notice of what was written on other stones in the church yard and I saw that a lot of the stones where heavy weathered what makes the texts invisible. I'd lost my last plectrum some days before and bought at the local guitar shop new ones. It was not time yet so I took my time to inhale the harbour atmosphere. After the Folk Club I walked in the dark back to the camping. Next year I want to visit the Abbey and the Church and read more about the history. Robin Hood's Bay, wow, that is a place you have to see once in your life! Last year I played there also but didn't go down town into the little streets. This year the host of the Folk Club, Jim Foster and his wife invited me to stay overnight in their lovely house with many rooms. My room had a view on the bay. I was very happy with their hospitality and their care for me. Another surprise was to meet again the lovely and charming folk singer and musician Carrie Martin. After dinner we went to the Dolphin for the Folk Club. I played two short sets and sold some cd's. At home again we drank some wine and had talks about interesting matters. The plan was to leave England and drive to the Highlands. But before I left Robin Hood's Bay Jim asked me to help him with emptying the donation fish which stands at the bay. The donations are for the sea rescue organisation. The legend says that when you put a coin in the fish that it moves her tail. Only people with good eyes can see the movement. But it was a pleasure to take out all the coins together with Carrie Martin. After a last cup of coffee I packed in my stuff and left the bay. Around 7 p.m. I arrived in Strathyre, Scotland. I checked in at the camping and installed my tent on a nice spot with view of the feet of Ben Sheen (The fairy mountain of the Caledonians). I felt like coming home. Today I want to visit my friend Magi McGlynn who lives in the Glen of Balquhidder. Since some years we are friends. Magi is a bard, poet and spiritual man. His fame roams across the world and many come to visit him to ask him for advice, to talk with him and to listen to his wisdom and the truth he keeps. After a four mile walk I arrived at his place and after a while he arrived. It was fantastic to see him back. Magi was in a very excited state because his plans for a big play with musicians and dancers and pipers got that week a huge boost. Important pipers from New York and Scotland confirmed that they want to work with Magi and that was great news. Later we went to the pub for a beer and played for the Lord of GlenCoe the Poem song. It was good to be back. In the evening I went back to my tent and had the feeling that there would be someone I needed to speak with. When I arrived there was a little tent. I made some food, coffee and played on my guitar with a view on Ben Sheen. When the night came the owls called from both sides of the Glen. Today I stood up with the sun on my tent and during a cup of coffee I played my guitar while I was sitting among the gras where the dew was still on. A sort of tune came up and some words. While I was playing my eyes studied the mountain hill and I thought: “what does this mountain wants to say to me”. Then I saw my neighbour and I started a conversation with her and we discovered that we had a lot in common. She told me that she was hiking across Scotland and that she was a writer and also a spiritual orientated person. We had a long talk about her life and mine and I asked her to stay a day longer because in my opinion we could talk the whole day about her and my life. But she decided to go further and it was all for the best because I could go further with my new song which actually needed all my time. The text and melody felt good for me and after dinner time I played the song over and over to get the good vibes and the right swing in it. As soon the sun disappeared behind the mountains it became colder and soon I had to go to bed. Tuesday May the 15th A brilliant song! Like last years I had planned to take some days off in my tour to be in the highlands. Especially this year I experienced it as a very welcome time to inhale the air and the energy of the area around Balquhidder. And I discovered that staying a little bit longer somewhere without any plans gives chances to discover and to see nature and things in a different way. So when I woke up, the day was an empty blank page. After coffee and breakfast I took my guitar and sat down again on the grass to play the new song. And I became silent. Because it was not me who wrote the song, it had just come upon me while I was sitting in front of the mountain. So in my opinion the credits go to the mountain! When I walked to Magi to see him I was in my thoughts busy with rhyming but nothing really came. But when I came closer to his place I heard the water of a stream and I saw the trees and then came suddenly in my thoughts: 'where the stream begins , where the trees forgive'. So after a coffee with Magi I played for him the second verse of the song and when I was finished with singing he was even more excited than the day before. He asked me how I knew that the trees forgive. I said him that I just walked and looked to the trees and let come in what came up in my thoughts. Magi said: “ You wrote just a very powerful truth down in your song. Let me show you something”. Then he showed me one of his drawings. And on it there stood a tree and a human and somewhere the words 'trees forgive' . And I was very very surprised and astonished about what I saw and heard. Like the day before I realised that it was not me who 'made' a song but it had been a matter of having my senses open for what was there. Everything that I heard and experienced the last days had a huge impact on me. I felt overwhelmed and excited, especially about the magic of the songwriting and all the energy that had reached me from the mountain and from the land of Magi. This Wednesday the 15th of May in 2018 will stay in my memory for ever. And I want to thank Magi, the Highlands, The Crystal Burn and the trees for their patience with me and their warm love. Another day in Balquhidder. I went with Magi to Calander. To do some shopping and to visit the book- and poetry store from two lovely old people. Their shop has the most and oldest poetry of Scotland. In their backyard stands the oldest Rose of Scotland from Glen Coe. It feels so welcome to get coffee and have a little talk with them. In the evening I played in the Mhor 84 Motel. Kenny and Barbara were there to listen to me. Kenny was the one who was asking me to play years ago at the festival where I met Magi. Time to go North, to the North West Coast of Scotland. After I had packed my tent I left Strathyre and took the road to Ford William. In time I arrived in Gairloch and it was very good to be back again. Gairloch is in the winter desolated and empty. My performance was in my opinion very nice and the audience was enjoying the music. So what do you want more? After a typical Scottish breakfast I left the Gairloch Inn and went to the ocean to refresh myself with the cold salty ocean water. The road to Ullapool is breath taking beautiful. It is like you drive in a movie. This time I stopped several times to sit and watch the ocean, nature and to play the news song. While I was driving I got the strong urge to go back the next day to Magi to record his drums and the Crystal Burn sound for my new album. And a good plan was born! I arrived in time in Ullapool and a warm welcome of the people of the Argyll Hotel gave me a very welcoming feeling. I had a nice bay view hotel room. I took a walk into the village and found a nice shirt that was fitting with the colours of my green lumber jack shirt. So I bought it and it was a good choice according my mother and others who have more knowledge about clothes and style. That night I played in the bar of the Argyll Hotel and made some new friends and got some information of places where I can play perhaps in London and Wales. Today I have to leave the beautiful North West. Before I went to my lovely friends in Canonbie I visited Magi for a short recording session. We recorded the drums and guitar for the Crystal Burn song and the sound of the Burn. I said goodbye to Magi and drove to the border of Scotland. I arrived just in time because Diane and Mick were just starting to have dinner. It was nice to meet them again and hopefully next year we have more time for a concert or talks. Last year I met one of my facebook friends Averil. This year I also wanted to meet and talk to her so we made an appointment on Tuesday morning in Droitwich. I stayed overnight at an empty camping with the name “Woodhall Camping” (again the word 'Wood'). Just an empty meadow but with some fireplaces. So the last night I sat outside till late close to the fire and enjoyed the starry night and the warmth of the fire. Thinking a lot about all that had happened the last weeks. And as you have read , that was a lot. The tours to the UK are actually very impressive each year. They do something with me. But this year it felt even deeper and more honest. Tuesday May the 22nd To Dover and back to Europe. After a very nice and inspiring time with Averil, who had made a beautiful sketch of me, I had to go further to be in time in Dover for the ferry to France. I arrived even earlier than planned and could take a ferry earlier. Leaving England was in a way sad but also great because it gave me so much. The tour brought so much inspiration and positive impulses. Food for long summer days and long winter nights. 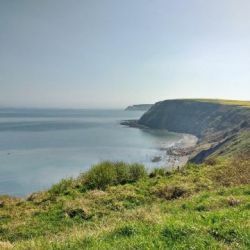 Carrie Martin wrote me some days ago: “ It would be fabulous if you want to come to the Robin Hood's Bay Folk Festival next year!”.